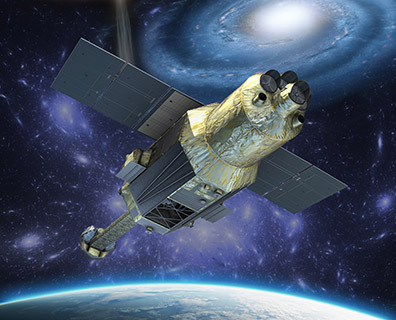 March 30, 2016 – Japan Aerospace Exploration Agency (JAXA) has been trying to communicate with the X-ray Astronomy Satellite “Hitomi” (ASTRO-H), using ground stations both in Japan and overseas. By utilizing two opportunities of communicating with Hitomi, JAXA received signals from the satellite: the first time was at about 10:00 p.m. on March 28 at the Uchinoura Ground Station, and the second one was at around 0:30 a.m. on March 29 at the Santiago Tracking Station in Chile. JAXA reported that communication with Hitomi, launched on February 17, 2016 (JST), failed from the start of its operation. JAXA has not been able to figure out the state of its health, as the time frames for receiving the signals were very short. According to the U.S. Joint Space Operations Center (JSpOC), it is estimated that Hitomi separated to five pieces at about 10:42 a.m. on March 26. In order to investigate the situation, JAXA is observing the objects, using a radar located at the Kamisaibara Space Guard Center (KSGC) and telescopes at the Bisei Space Guard Center (BSGC) owned by the Japan Space Forum. Up to now, the telescopes at BSGC detected two objects around the satellite’s original orbit, while the radar at KSGC identified one of them. It is confirmed that the signal received at the Santiago Tracking Station came from the orbital direction of the object identified at KSGC. JAXA continues to investigate the relationship between the information from JSpOC and the communication anomaly. The Japanese space agency is still hopeful that it can recover communications with Hitomi and investigate the cause of the anomaly.